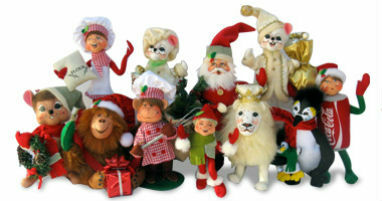 Christmas is a great time to get into collecting Annalee Dolls. The Christmas collection has built memories in my family for years! Please take your time and browse the categories of dolls below and find the holiday doll that will build memories for your family. Annalee Doll Description: Last one. Open eyes, closed mouth with two teeth as shown, bright pink hair, white felt wings, floral print overalls accented with lace, holds shovel, green felt base. This doll came from Annalee Design and was never put into production - one of a kind! Signed by Chuck Thorndike in 2001 on back of wings.